The heart of any synth. Over the time I have designed several VCOs, which I'd like to present here. 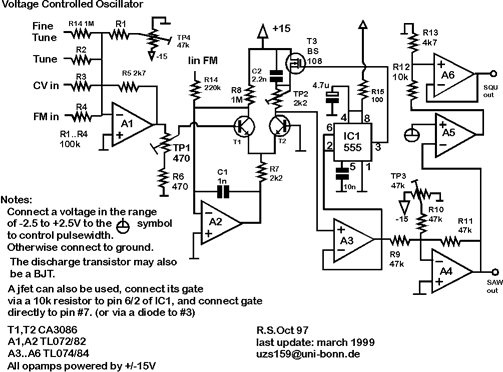 This circuit was my first attempt, back in '96 when I started building my first synth. It is a bit crummy viewed in retrospect. 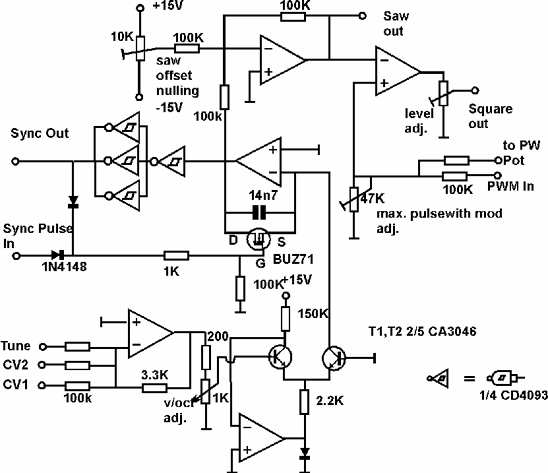 The BUZ as discharge switch is far from ideal, and the 4093s made it impossible to build two oscillators with the same amplitude. And it was not temperature compensated. It is here due to historical reasons. I put the knowledge that I gained from my first steps into the next VCO. Things still to be improved was temperature compensation, and the discharge switch. I started with the idea to measure somehow the temperature of the transistor array to get a voltage inversely proportional to absolute temperature. I wanted to multiply the input with this voltage to get the scale factor compensated. But then I noticed that my multiplier (a diff amp) had the same temperature dependancy like the exponentiator. And the result was that I put it in the feedback-loop of an opamp to turn this dependancy into its reciprocal, therefore giving good thermal stability. Here's the circuit: Temperature compensation amplifier. Description of the tempco amp. 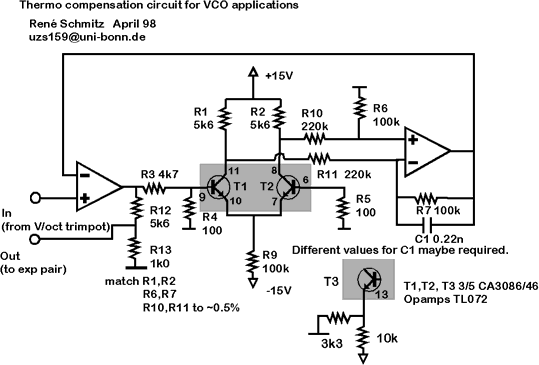 Several people have tried this circuit and Henri Kovalainen did a PCB layout for the VCO with the tempco amp.